Student Food Scarcity and Homelessness Flyer. The term homeless is challenged when it strays from its visual stereotype of a person living in the streets, who lacks money, food and domestic resources. College students might not realize that while they focus on taking notes during lectures, others may also be worrying about when their next shower, meal or opportunity to sleep in a bed will be. 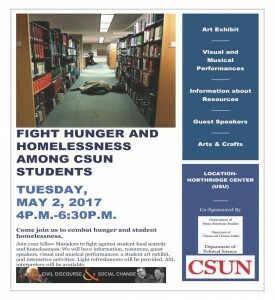 California State University, Northridge’s Civil Discourse and Social Change (CDSC) Initiative will host a student food scarcity and homelessness event on Tuesday, May 2, from 4 p.m. to 6:30 p.m. in the University Student Union’s Northridge Center, located on the east side of the campus at 18111 Nordhoff St. in Northridge. The event is free and open to the public. Until a year ago, Paramonova said she was unaware of the homelessness and food scarcity issues students face. The revelation occurred when one of her students stopped coming to class and confided that she had recently become homeless with her two children and was struggling to come to school. Later on, Paramonova was shocked to discover that several of her students had become homeless while in college. Paramonova began asking her colleagues what they knew about CSUN’s homeless student population. She said some professors had no knowledge of the predicament, while the ones who did know, believed that their homeless students generally dropped out of college. According to the Free Application for Federal Student Aid (FAFSA), more than 58,000 college students nationwide identified themselves as homeless in 2013. FAFSA projected the number would increase by 75 percent within the next three years. Affordable Colleges Online’s article on Homeless Youth and Higher Education indicates the 58,000 figure is underestimated because many homeless youths are unaware that they qualify as homeless and are ashamed of admitting their living situations. Last year, the “2016 Serving Displaced and Food Insecure Students in the California State University (CSU)” study calculated that out of 460,000 students in the CSU, one in every 10 was homeless. This calculates to 46,000 or more CSU students that are homeless. At the event, students who are currently homeless or who have found themselves homeless during their academic year will share how they stray from homeless stereotypes. “We can put a face to these people who we have stereotypes about,” said Paramonova. According to the National Law Center on Homelessness, the leading cause of homelessness is the insufficient income and lack of affordable housing. Parmaonova’s advanced public speaking class researched the CSU system’s homeless issues and the programs created to aid homeless students. During the event, students will present their findings and work with attendees to try to formulate plans for CSUN to establish homelessness and food scarcity programs. The event is supported by the CDSC and CSUN’s departments of Chicano/a Studies, Political Science, Communication Studies and Asian American Studies. For more information please visit the CDSC website.